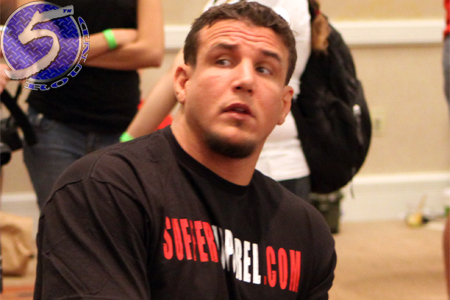 Courtesy of the injury bug, it appears Frank Mir (Pictured) will not be a one-time Strikeforce fighter after all. According to Sports Rage (and various other outlets), Mir will be forced to withdraw from his November 3rd scrap against Daniel Cormier with an undisclosed wound. Mir volunteered to temporarily transition to Strikeforce to face Cormier in the final heavyweight bout in the promotion’s history. He was to be the first active UFC athlete to cross over to its sister company. No word on who will replace Mir in the event. Last December, Strikeforce decided to eliminate the 265-pound class from its roster. However, broadcast partner Showtime required for the Heavyweight Grand Prix winner to defend his belt once before erasing the division. Most of Strikeforce’s elite heavies have already been promoted to big brother UFC. Cormier bumped his professional mixed martial arts record to a perfect 10-0 by cruising to a unanimous decision victory against Barnett in May. He took home this monstrosity for taking the tourney. Chesapeake Energy Arena in Oklahoma City, Oklahoma hosts the festivities.